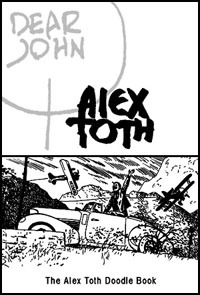 "Featured for the first time will be the exclusive screening of the documentary Simplicity: The Life and Art of Alex Toth. The documentary will show what made Alex such a unique and beloved artist. Following the screening will be a brief panel discussion featuring the appearance of Mark Chiarello, Ruben Procopio, Toth’s children as well as documentary producers Alex Gray and Jon Mefford. Room 3"
Eric Toth has let us know that in addition to Mark Chiarello, Rubén Procopio and Jon Mefford, he and his Brother Damon will be there representing the Toth Family. Eric also mentioned, "I have seen a rough cut (of the documentary) and it will be very good". Last year's panel was super fantastic, so don't miss out on this event!